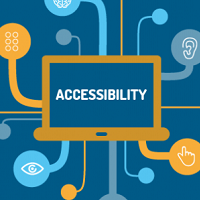 This workshop will look at the Web Content Accessibility Guidelines (WCAG) as a conceptual framework to inform the design of DH projects. Participants will be provided with an overview of WCAG standards, shown specific examples of success criteria, and be encouraged to incorporate accessible design thinking into their projects. The Virtual Blockson, a project to recreate the Charles L. Blockson Afro-American Collection in virtual reality, will be used as a case study to help participants better understand how these design principles can be applied to their own projects.